One 8" x 10" b/w photograph of a group of people at a table at the Four Seasons Club. They all have drinks and one woman is smoking. Indentified are (from L to R starting with the woman with her back to the camera): Shirley ?, Albin Deering, Paula Paepcke (Zurcher), Hoyt Pfeifer, Tukey Koffend, Fritz Benedict and Jean McMillian. 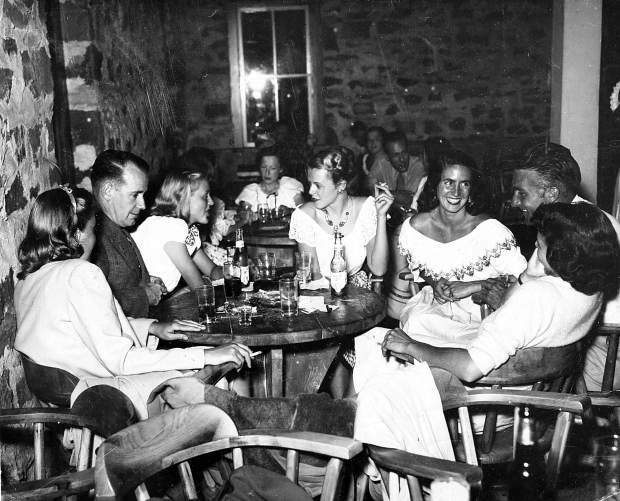 Several other tables of people can be seen in the background, 1947. “Four Seasons Club finishes alterations,” announced The Aspen Times on Nov. 20, 1947. Regarding the popular après-ski spot, the paper continued: “The alterations that have been in process for the past several weeks will be finished by Thanksgiving, Walter Haug announced late this week. Haug said he was pleased to be able to say that a propane heating plant is being installed and should be in running order by the last of next week. The upstairs lounge with the fireplace is all but finished, and, if the furniture arrives in time, should be open by Thanksgiving. The lounge will be furnished as a comfortable sitting room where members may relax in comfortable chairs before a bright fire after a day outdoors. Drinks will be served in the lounge, and the room will be available for dinner and cocktail parties.” The photograph above shows people enjoying drinks at the Four Seasons Club, 1947.